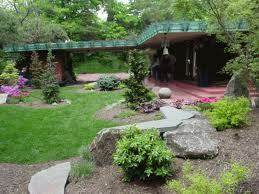 West Lafayette might seem an unsuspecting place for a Frank Lloyd Wright designed home. However, tucked away on a heavily wooded, sloping, one acre lot just a few blocks off of from the north-west corner of the Purdue campus, sits Frank Lloyd Wright’s SAMARA House. Built in 1955, the home was designed for Dr. John Christian, his wife, Catherine, and daughter, Linda. Both being professionals at Purdue University, Dr. Christian and Catherine wanted a home where they could entertain students and faculty. Considered to be one of the most complete Frank Lloyd Wright homes in existence, the 2,200 square foot house includes over forty of Wright’s innovations. Dr. Christian still owns and occupies the home today, and welcomes guests for pre-scheduled tours. Tours available by reservation only, April through November. Call (765) 409-5522 in advance to reserve.